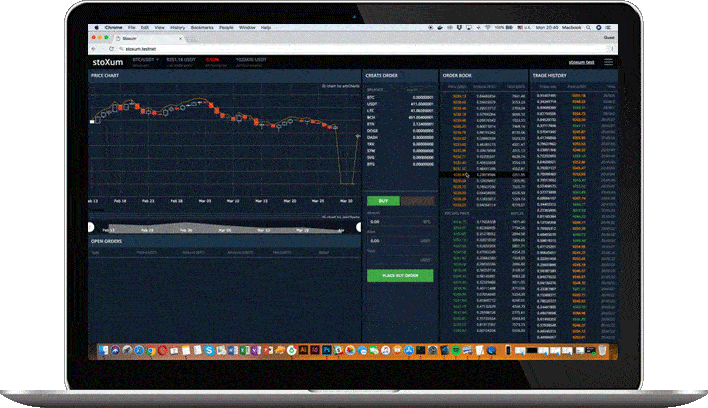 STOXUM is born from the idea of creating a crypto Exchange platform. Why do something like this with the amount of current competitors in the market? Because the idea of Stoxum is different: dividends and white label solutions. These two characteristics together make STOXUM a UNIQUE platform in the market, since not many platforms (or any) offer simple White Label solutions, and STOXUM token holders receive dividends on 100% of the platform revenue depending on how many tokens they have. The business of cryptocurrencies increases more and more. Every day, new ICOs are launched to the market. Some have a decentralized system, others, the opposite, which makes each of them have certain benefits and disadvantages over the other. STOXUM grabs the best of centralized and decentralized systems to create the first hybrid decentralized cryptocurrency exchange with a 100% share distribution. The best way to exchange your cryptocurrency, with the reliability of a decentralized system and the speed of a centralized one. STOXUM is a cryptocurrency exchange platform, the first global hybrid decentralized one, a unique system in the market. This results in a platform with all the advantages of both systems and none of the disadvantages. This makes STOXUM a reliable, fast and efficient system when exchanging your cryptocurrencies. STOXUM offers the possibility of downloading completely detailed reports, if you are a token holder, of all transactions carried out on the platform. With this an absolute transparency is guaranteed, increasing the reliability of the site. According to CoinMarketCap, this is the Top-5 cryptocurrencies right now, and Stoxum allows you to swap them. With a unique voting system, STOXUM users are responsible for deciding what the new cryptocurrencies will be, up to 2, which will be added every month. If you want to know the result of the voting, a detailed report is offered to guarantee the transparency of the process. With the White Label System, each company or entrepreneur will have at their disposal the necessary tools to launch their own Brand, in a simple, fast way and without the need to invest in large teams of programmers, web designers and the whole group of people needed to launch a project or Brand. With White Label solutions you can launch your own crypto exchange in no time, avoiding the long programming processes. Each platform created using White Label has at its disposal all the main features of STOXUM, as well as the ability to customize it to your liking. This option is ideal for companies that want to invest and create their own crypto exchange. Dividends will be 100% of the profits of the exchange and all products that are in the ecosystem platform. This translates in: depending on the amount of tokens you have, you will receive a proportional amount of dividends, which means that you will have income according to the amount of dividends you have. If you are a token owner, you will have access to a number of statistics and reports, such as the report of all transactions made in the platform, guaranteeing transparency, as well as different opportunities within the ecosystem of the platform. The open source of the platform allows other users of the community to contribute their part to the development of the same, contributing to its growth. What can you do in the platform? As we said before, you can create your own brand, and as the Whitepaper says: “All financial indicators of the platform are completely open and the pool of liquidity unites third-party projects working on the White Label system”. Besides that, having the control to verify the operations carried out with the complete statistics, including new cryptocurrencies through the voting system, develop and contribute with the platform thanks to its open source system make STOXUM one of the best new platforms of crypto Exchange.